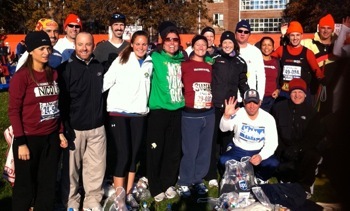 Members of the Grassroot Soccer Marathon Team prepare before they enter the starting corrals on Staten Island. 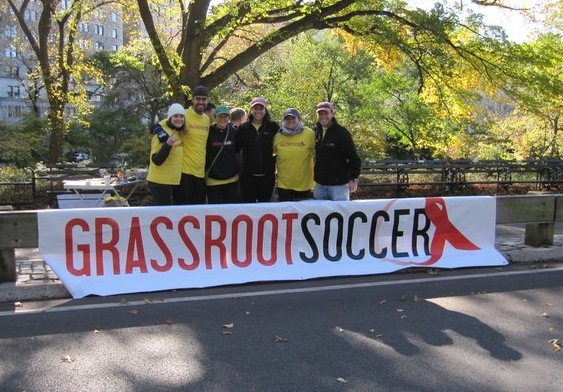 On a dark and chilly November 7th morning in New York City, 50 runners took to the streets to participate in the 41st ING NYC Marathon on behalf of Grassroot Soccer (GRS). In addition to the personal goal of completing 26.2 miles, these athletes also raised funds for Grassroot Soccer HIV prevention programs in Africa. To date, the Team has raised over $160,000 with support from 1,900 donors to enable 6,400 youth in Africa to learn the knowledge and life skills to be AIDS-free. Ethan Zohn, GRS Co-Founder and Ambassador Council Member, captained the 2010 Team. His race was especially fulfilling after having to drop out of last year’s training due to a diagnosis and successful treatment of non-Hodgkin lymphoma. Dedicated GRS fans stake out a viewing area early in the morning in Central Park. Ethan led a global team with two runners from Canada, four from the UK, and 43 from eight different states in the U.S. Two runners, Stephen Brown of Philadelphia and Angela Mwanza of New York City, returned for their 2nd year to run the Marathon for GRS. GRS Intern Alums made a strong showing with Nick Colacchio, Emily Geldwert, and Caitlin Sparks all finishing the race in personal record times. Their fellow alums joined GRS staff and runners’ families at the viewing party to cheer on the runners at Mile 24 in Central Park. This was the second year that GRS has been chosen as an official charity partner of New York Road Runners. In 2010, 35 runners ran the 40th ING NYC Marathon and raised $130,000 effectively helping 5,200 youths. This year, GRS was granted 40 spots and gained another 10 runners through the Marathon lottery and runners who had deferred from 2010. 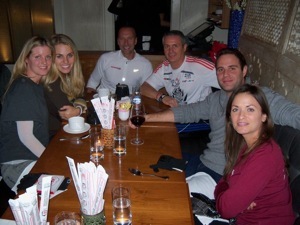 The GRS pre-race dinner supplied essential carbohydrates for Sunday's Marathon. GRS and its beneficiaries are sincerely grateful for the efforts of the 2010 Marathoners, and the support of all the donors who supported them. To make a contribution to the team or to sponsor a runner visit the GRS Team Page: http://www.active.com/donate/grassrootsoccerrun or send a personal check to Grassroot Soccer PO Box 712 Norwich, VT 05055. Grassroot Soccer is now collecting applications for the 2011 GRS Marathon Team. If you are interested in participating please email nycmarathon@grassrootsoccer.org for more info.